Submitted by lynn on Friday, January 19, 2018 - 2:21pm. San Diego Restaurant Week starts this Sunday on January 21 and continues until January 28, 2018. 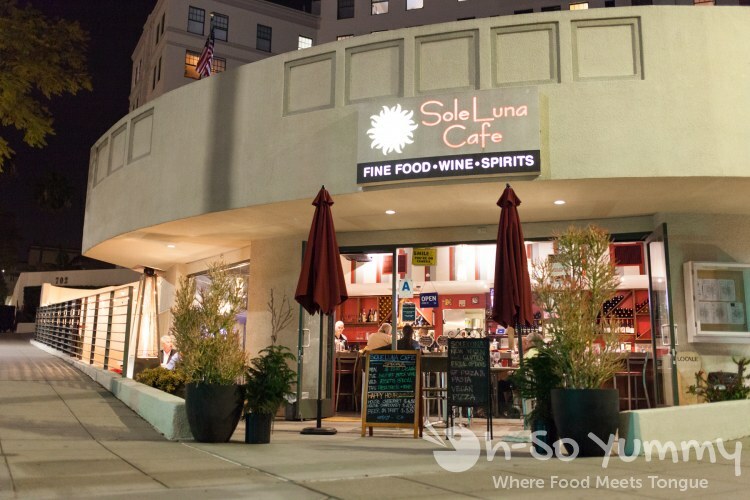 We're always excited to partner with local establishments such as SoleLuna Cafe. 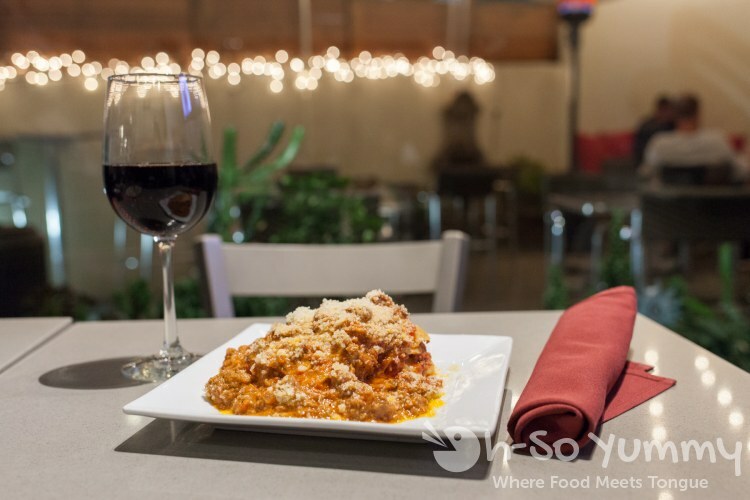 This Italian restaurant is located in downtown San Diego and has been open since 2006! Their offering is a 3 course dinner for $20 with optional $15 wine pairing. There are also vegetarian and gluten free options available. We were greeted by the owner Michele, who had been manager for several years before becoming the owner. Michele and our server Francesco chatted with us throughout the evening and made sure to keep the flow of food going smoothly. Both are originally from Italy, proudly bringing a bit of their home into this neighborhood. After ordering, complementary bread with bottles of olive oil and balsamic were set on our table. I'm actually participating in a clean eating meal plan during January so made an exception this night because I couldn't resist trying a new place! SDRW choices included stuffed portobello mustrooms, bruschetta sampler, salmon chowder, or insalata mista. The mushroom dish looked fantastic and came in a shareable size as well! We enjoyed the brightness of the sun dried tomatoes which flowed perfectly with the gorganzola cream sauce. The breaded stuffing was softer in texture and offset some of the creaminess. I wanted to mop up all the sauce with appetizer bread! 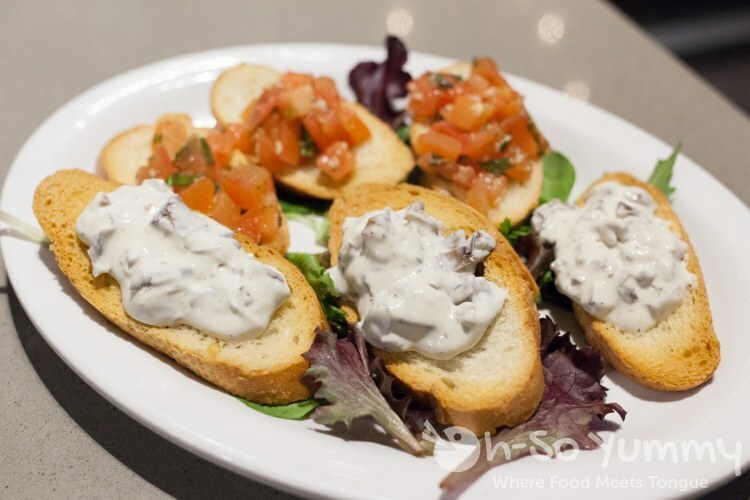 The bruschetta came in two styles. The first showcased ripe tomatoes in the traditional style though I usually prefer more olive oil in mine. 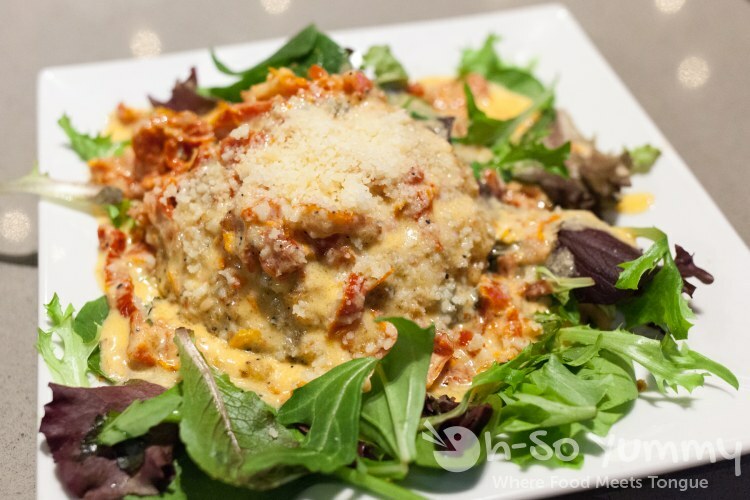 The second version offered a chilled mushroom topping which reminded us of cream of mushroom! 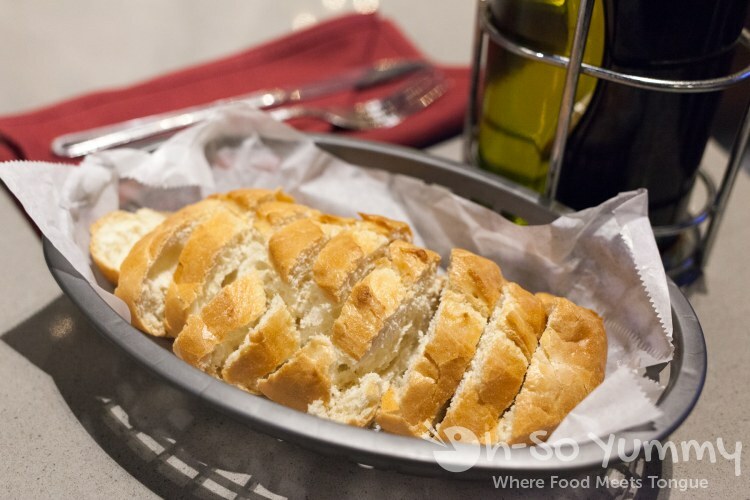 The crostini base layer was simple without extra butter, oil or grilling. 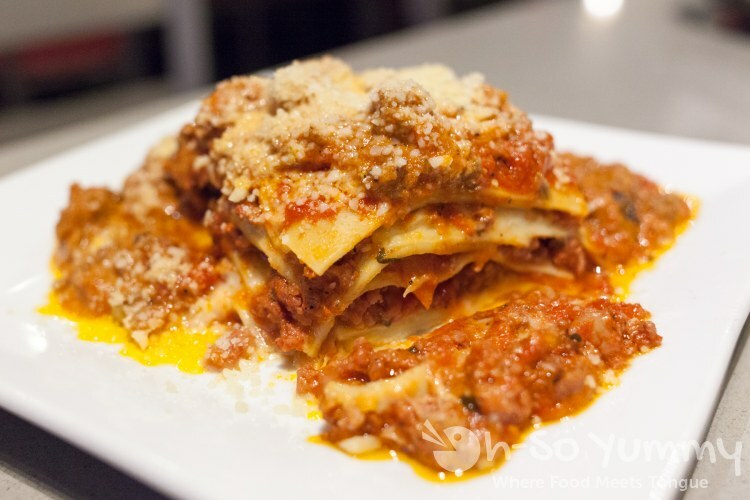 SDRW choices included lasagna classica, penne arrabbiata, tortellini, fettuccine mare e mont (mushroom & shrimp), and eggplant parmigiana. The owner mentioned that the fettuccine dish was a rotating item on the menu to provide variety for the regulars. 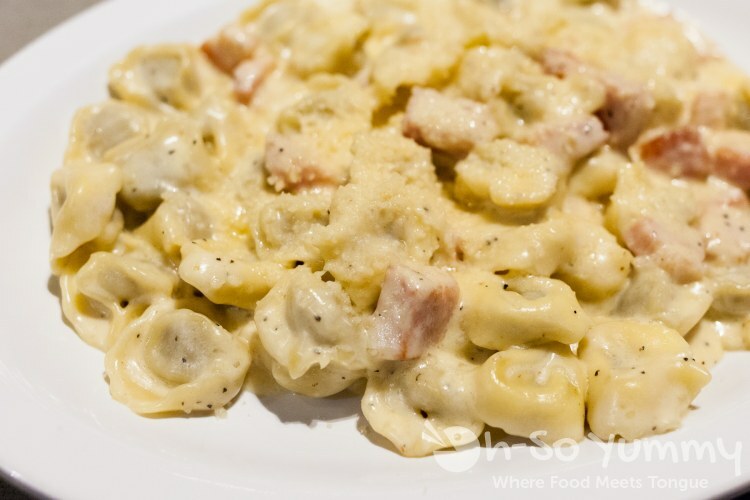 The al dente tortellinis were bite size and lightly covered in a cream sauce. I appreciate when pastas aren't drowning in sauces! Every now and then, a little chunk of meaty bits found their way to our mouths and we happily chomped through half of this. We were already quite full after entrees but needed to save room for the last course! A second to-go box was requested for another Dennis-only meal. SDRW choices included affogato al caffe, homemade tiramisu, and chocolate mousse. Since we don't drink coffee, we selected the latter two. 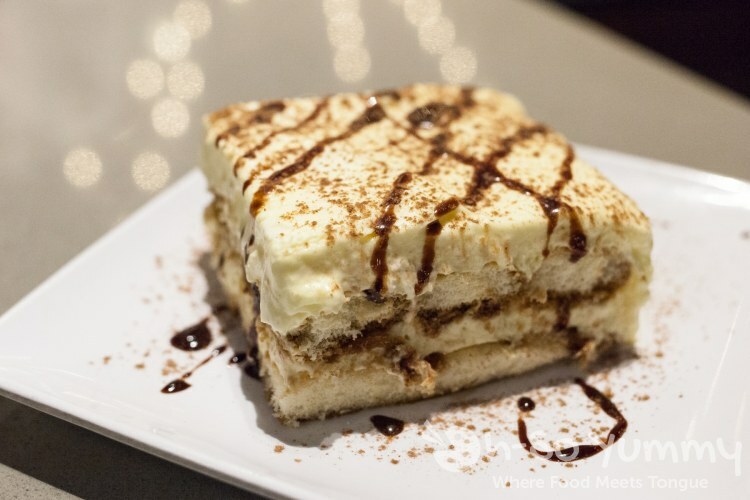 This tiramisu was fluffy and not heavy on the coffee taste (thank goodness). It made for a sweet ending to our already great night. I couldn't stop eating this final dessert though. The best part was the touch of crunchiness in the bottom chocolate layer that reminded me of Ferrero Rocher (yet I still have to look up the spelling every time). Dennis isn't a fan of mousse so he let me eat every last bite, which I happily did. It was a perfect date night opportunity for us. We shared a lovely Italian red with our main course and had a bubbly glass of Prosecco with the appetizers. Dennis was enthralled with his "first" Prosecco but I mentioned we tried one through Boutique Vino. Tuesdays are also half-price wines and every table around us had at least one bottle for sharing. They looked quite content, possibly regulars who enjoyed the quiet ambiance as much as we had been. Let the good times roll! SoleLuna Cafe has free street parking after 6pm though being a block away from the symphony may make it harder on concert nights. They do offer a discount to attendees with a ticket stub! The restaurant is cute and casual, and San Diego Restaurant Week is a perfect opportunity to sample their menu. If you don't make it out during that week, there are always the daily specials. We're already considering popping back in for their Monday $10 lasagna special when I've completed my clean eating routine! Restaurant 2: $10 Lunch at Cicciotti's Trattoria Italiana and Seafood. I could live on Italian food alone. And Prosecco! I'm a huge fan of bubbles. And northern Italian reds. Let's be real, I just like wine. HAHAHA! Wow, these look amazing. 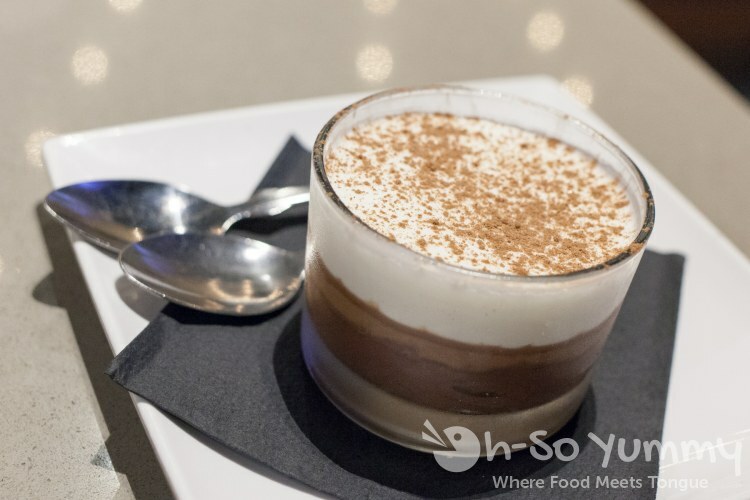 I will definitely make a trip just for the tiramisu ! That's a nice preview of Restaurant Week! Tiramisu looks great! We are going to Rei De Gado next week. Okay since I'm on a special diet, too, that bread looks extra good to me. And so does that lasagna. The layers look amazing! Sounds like a great meal AND a great deal, too! i'm a sucker for meat sauce and cheese! bread doesn't tempt me so much unless it is from a bakery (85C pops into mind). Really loved our visit to Sole Luna last year. The food, atmosphere and service are all top-notch! I can't wait to return!